Featuring work by the late Yutaka Matsuzawa, three New York artists and Tanaka herself, the exhibit titled "if the wind blows" draws parallels between the March 28, 1979 nuclear power plant incident near Harrisburg, Pennsylvania and the March 11, 2011 disaster at Fukushima Daiichi, triggered by an earthquake and massive tsunami in northeastern Japan. It also includes a monthlong event series through Saturday with experimental films, documentaries and public discussions on the dangers of exposing civilian populations to radioactivity, whether through accidents or nuclear waste disposal. "I have been antinuclear since I was 11 years old," said Tanaka, 56, who is originally from Japan's Tochigi Prefecture and immigrated to New York in 1996. 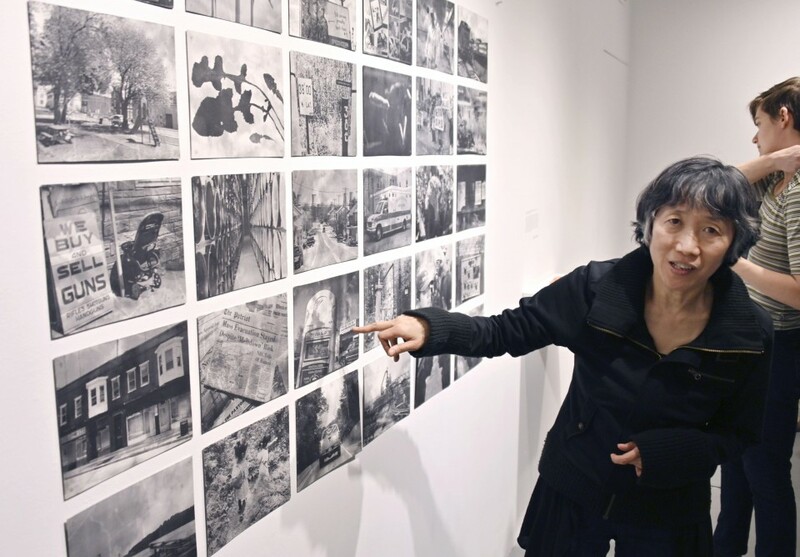 The artist explained that her "chief concern" in the early stages of her career had been the history of nuclear weapons, but she expanded her research into nuclear power plants after the 2011 Fukushima disaster. Her concern grew even further in 2012 when a forest in her home prefecture north of Tokyo became the first candidate as a disposal site for radiation-tainted waste from Fukushima. Due to strong local opposition, the Japanese government was compelled to move the site to a neighboring town, though Tanaka pointed out the change in location "does not solve any problem." In 2015, she made her first trip to Harrisburg to research the U.S. nuclear accident and meet with locals, efforts that culminated in the art books "Under This Sky" and "Visible, Invisible." The latter, on display in the present exhibition, draws on testimony from Harrisburg residents including Mary Stamos, a collector of misshapen plants whose deformities may have been caused by radiation. Tanaka returned to Harrisburg this year for the 40th anniversary of Three Mile Island. Joined by two other Japanese researchers, she interviewed locals and participated in the March 28 candlelight vigil held annually in the pre-dawn hours outside the power plant, which is still in operation. The three discussed the experience at a March 30 panel called "A Report Back from Three Mile Island" at the exhibition venue in midtown Manhattan. Hiroko Aihara, an independent journalist from Fukushima, noted the similarities between Fukushima survivors, whom she encountered as an emergency aid volunteer in the aftermath of the 2011 disaster, and those she interviewed in Pennsylvania who have been coping with uncertainty and risk for decades. "I had a flashback because of the strong similarities (of the situations) -- especially the survivors," she said. "They were anxious, anxious about the future and health issues." Kyoko Sato, a sociologist and associate director of Stanford University's science, technology and society program, said the emotions surrounding the Three Mile Island incident remained intense, especially for mothers who regretted letting their children play in areas that may have been contaminated. After the discussion, audience member Steven Thrasher reflected that "Americans don't think much about nuclear energy, and so it's great that Tanaka and Kyoko Sato are encouraging us to do so." "Many of the conditions which affected Fukushima exist in California, too, so it would be better to consider them now before disaster strikes," added the New York University PhD candidate. Although U.S. authorities have not directly linked the 1979 accident to any deaths or adverse health effects in the surrounding communities, the failure sparked nationwide protests and shook the country's faith in nuclear energy. Despite a precipitous decline in new construction of nuclear facilities, the country has continued to supply roughly 20 percent of its own energy through nuclear power plants each year over the past three decades. The reactor at Three Mile Island that did not malfunction in the infamous partial meltdown has continued to operate -- one of 98 still active in the country as of 2018 -- though its owners have announced a September 2019 closure date unless regulatory changes under consideration by the Pennsylvania legislature are passed. According to a Gallup poll published a day before the 40-year anniversary of the U.S. nuclear disaster, Americans are split evenly at 49 percent each on whether the country should use nuclear energy. The poll also indicates that 47 percent of Americans say nuclear power plants are safe, as compared to 49 percent who say they are not.